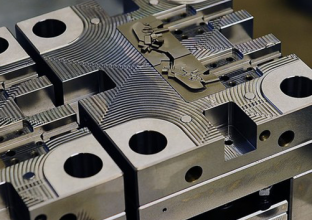 Production takes place in modern precision machining equipment of the highest class, tailored in size to our sizes of mould manufacturing and equipment. Production takes place in a planned flow through the facility, in the machine groups and departments for the respective operations. Machine groups are staffed during the day by skilled and careful staff, then production takes place 24 hours a day, 7 days a week on unattended machine groups, thanks to a flow-driven planning system for each machine cell. All work pieces and tools are rigged and measured with modern coordinate measuring machines outside each machine cell, after which the robots take over and feed and empty machines as working orders are completed. All coordinate systems on work pieces and electrodes, as well as offset and any corrections are exported to the respective machine groups via an effective and powerful order management system from efficient databases in our local network. This approach creates unprecedented opportunities to effectively plan and possibly re-prioritise orders of priority in order to create time-efficient production which is highly flexible and has unlimited possibilities.